The English learned how to use, and foment, trouble to their purposes, and this policy was know as Divide and Rule. I was born in the congo I walked to the fertile crescent and built the sphinx I designed a pyramid so tough that a star that only glows every one hundred years falls into the center giving divine perfect light I am bad. What does it mean to “normalize” relations with the U.S.? What does “normalize” mean? If Raul Castro is described as being “belligerent” to Barrack Obama, then what does that mean? Who is speaking? The day came and many of us, scattered across the country, waited. On this day, June 26, 2008, Rev. Edward Pinkney would be coming home. And then later that day, the news came. I called Dorothy Pinkney. He was returned to prison! An activist, fighting against the takeover of the predominately Black community in Benton Harbor, Michigan lead by Whirlpool, Inc and the Harbor Shores Project, Rev. Pinkney knew the results of this land grab would benefit the white community in adjacent St. Joseph. The U.S. government practices ignorance of the history of Western conquest, and it expects everyone within and without its borders to do the same. For years, Rev. Pinkney and the Black Autonomy Network Community Organization (BANCO) have fought against racist practices in Benton Harbor. When the movement led to the successful recall of Glenn Yarbrough, a local politician with ties to Whirlpool, city officials, lead by Yarbrough, went to work to frame Rev. Pinkney. Rev. Pinkney’s strategy to recall Yarbrough focused on mobilizing absentee votes, writes Ted McTaggart, in “The Framing of Reverend Pinkney.” The movement won a victory with 42% of the absentee vote! And Yarbrough’s response was to hold a “behind-the-doors meeting with Whirlpool and County Prosecutor James Cherry. What comes next? Vote fraud charges against Rev. Pinkney and the movement! After failing to convict Rev. Pinkney at the first trial, the judicial system in Berrien County called for another trial! Now Rev. Pinkney is facing an all-white jury! The white solution to the “problem” of the Black voice is to silence it within whiteness! Rev. 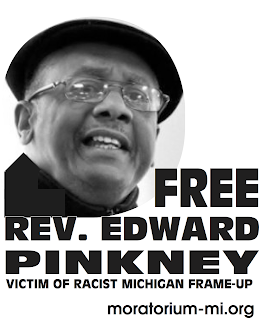 Edward Pinkney was sentenced to 3-5 years in prison! Back in Benton Harbor, the “colored” scoundrels were hurrying to get a piece of the action. Black city Commissioners Rahim Abdullah, Ricky Hill, James Hightower, Eddie Marshall and David Shaw along with Black mayor, Wilce Cooke support the land grab. They keep their jobs, their homes, and their children can attend good private schools and find a seat at an Eastern ivy-league university. They don business suits and talk like Mr. Big Man. The American Dream has come to them! We have seen a parade of these “colored” scoundrels: Alberto Gonzales, Condi Rice, John Yoo, Colin Powell, Congressman Rangel, and Gov. Richardson among others. In 2004, USA Today! claimed that Bush Jr. was opening the “doors with a diverse cabinet.” The top-tier colored people represent the interests of the capitalism and imperialism. That’s why the doors are open to this multiracial cabal of people who have turned their backs on the people to acquire a share in Imperialist power and profits. This colored cabal of scoundrels is everywhere corporations are grabbing the land, once again, from Black people. Take a look at the so-called Green revolution. The current administration of Imperialism is running around screaming about the Green Revolution! The Green Revolution. The Green revolution is coming! Anuradha Mittal, Executive Director at the Oakland Institute stated on WBAI’s Talk Back! that this green revolution is “basically colonization all over again.” In Africa, there’s a land grab by corporations like Monsanto and Morgan Stanley. The World Bank is promoting the selling of African land to these corporations. Food produced on the confiscated land is exported to the Western nation-states and held for the wealthy to distribute on that day when the capitalist economy really collapses once and for all. Poor nations in Africa are providing food for Western nation-states, China, Saudia Arabia, and Egypt - the same countries that have, for years, poached the food resources in the waters off the coast of Somalia. In the meantime, Black farmers are left landless and displaced or in debt. Colonialism once again? Where is the Black leadership? They are acquiescing with a nod and a hand shake as they walk the halls of the World Bank and the IMF. As Mittal explains, this “white man’s solution” for Africa is condoned without consulting the Black people - the farmers themselves. There’s no platform for Black voices to be heard.” The “top down approach” and I would add, Black Big Man approach, silences the Black farmers. Just as the governments and corporations see in this land grab “a big investment opportunity” in Africa and in Black communities in the U.S., as Mittal said, the Black middle class has recognized in this land grab an investment opportunity for their own families and friends. In urban cities in the U.S., Black poor and working class and unemployed have been displaced to provide housing for predominantly white middle and upper classes - with the help of the Black leadership. This Black class of no conscience complies with the system of oppression, and it’s no different in Benton Harbor, Michigan. Benton Harbor’s Black politicians, civic and religious leadership is now enslaved to the corporate masters while the poor and working class Black community is exploited and displaced. “They don’t care who they hurt,” Rev. Pinkney said. This is an issue of international housing and food security for the rich and a crisis of international proportion for Black people - and the discourse of resistance is being taken over to silence the people. In the courtroom, Judge Wiley announced that the passage presented a “threat” to Judge Butzbaugh, the one whose law firm has financial interests in the Harbor Shore Project and who sentenced Rev. 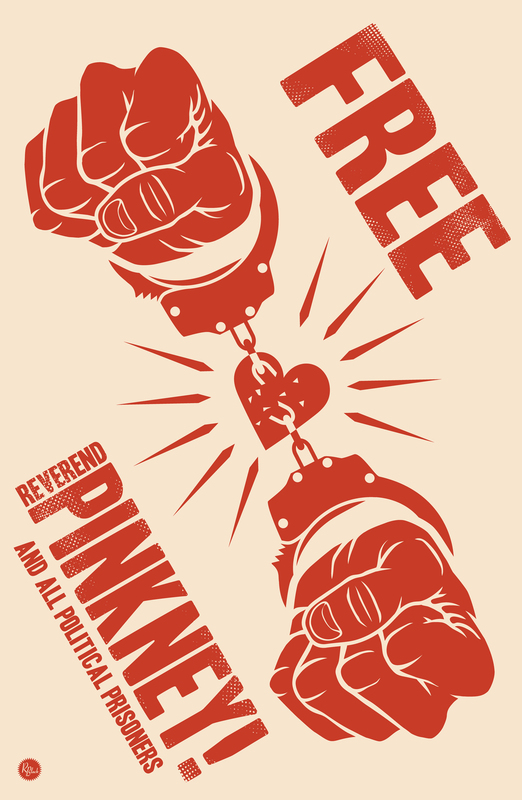 Pinkney to prison. Butzbaugh never read the article. But Judge Wiley heard a threat (to government power?) in the Biblical quote! Instead of going home, Rev. Pinkney was returned to prison! “I could call God down and have him do something,” Rev. Pinkney told me. Rev. Pinkney recognized in this display of “madness” a method, a justification for returning Rev. Pinkney and the voice of the poor and working class Black community to the “margins” of society. The anger of enlightened Blacks around the world is real! - because what does it take to “normalize” relations with the U.S. government? How is President Obama’s fear over of what he’s terms “inciteful” language directed at the U.S. and Israel unconnected to Judge Wiley’s charge that Rev. Pinkney’s quoting the Bible is a threat to the State? The world wide corporate media will speak of “investment opportunities” from the point of view of the SUBJECT: imperialist nation states and their allies. Others who dare to challenge this perspective will be denounced as “criminal” for violating the Silence. On June 26, 2008, the prosecutor failed “to file a brief on this case with reference to the Bible quote,” said Rev. Pinkney. On June 9, 2009, this case will have a hearing on the right to free speech, free expression. In the future, this case will “set the standard,” and it will be “used as case law.” “This hearing is crucial for every single American.” At 9:00am, on June 9, 2009, citizens interested in preserving the first amendment rights of their fellow citizens, should come to the Court of Appeals Building in Grand Rapids, Michigan, 350 Ottawa Street. May 1st is International Boycott Whirlpool Day! Take action! Be belligerent! Boycott Whirlpool!